A famous experiment on the behavior of bystanders was inspired by an electrifying episode in New York City in 1964 when Kitty Genovese was stabbed to death in the middle of a street. According to newspaper reports, although many people witnessed the early morning attack from their apartment windows when they heard screams, no one tried to stop the assault, and no one even called the police. 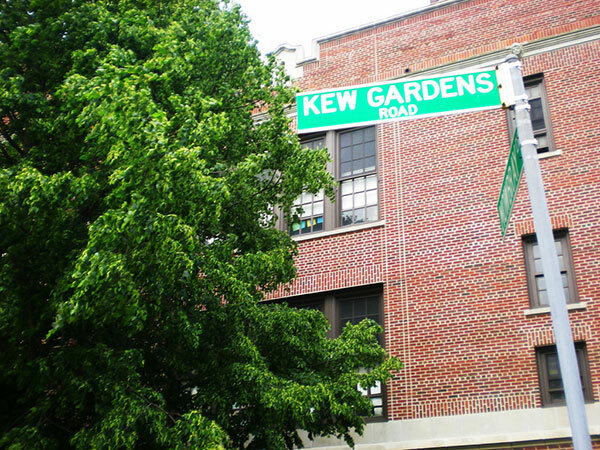 Kitty Genovese was killed in Kew Gardens, Queens, on her way home. Image: Kew Gardens Road by Edgar Zuniga Jr. CC BY-ND 2.0 via Flickr. John Darley and Bibb Latané (1968) conducted an influential experiment in the wake of the Genovese murder. Participants were told that they would be talking about personal problems associated with being a college student. Each was in a room alone, thinking that he or she was talking to other students over a microphone. Sometimes participants were led to believe that there was only one other participant (group A), sometimes that there were two others (group B), and sometimes that there were five others (group C). In fact, the voices they heard were recordings. Participants were told that while one person was talking, the microphone arrangement would not let anyone else talk. At some point, the participant would hear a person – the “victim” – say that he felt like he was about to have a seizure. The victim would ask for help, ramble a bit, say that he was afraid he might die, and so on. His voice would be abruptly cut off after he talked for 125 seconds, just after he made choking sounds. The percentage figures for participants who left the cubicle to help before the voice was cut off are striking: group A 85%, group B 62%, group C 31%. Also, all the participants in group A eventually reported the emergency, whereas only 62% of the participants in group C did this. Clearly, participants’ beliefs about how many other people could hear the voice – none, one, or four – had an effect on their behavior. According to a pessimistic view, findings of this kind suggest that we have very little control over our behavior – that human behavior is largely driven by the situations in which we find ourselves and the effects these situations have on unconscious, automatic behavior-producing processes. I’m not so pessimistic. Obviously, there’s a difference between not doing something and not being able to do it. Even in group C, about a third of the participants went out to get help. My guess is that most of the others could have done the same – that it was to some extent up to them whether they did or didn’t help. Are we to believe that it was simply impossible for the non-helpers to behave like the helpers? A pessimist may claim that everything we do is completely determined by the situations in which we find ourselves, that we have no control at all over how we respond to these situations, and that the non-helpers therefore couldn’t have helped. The claim is off base. If situations really did completely determine behavior, then everyone in the same situation would act the same way. But only 69% of the people in group C refrained from helping; the others helped. This pessimistic view of decisions isn’t true to the facts. What can we do to get potential non-helpers to help? Lots of people find striking “news” about human behavior interesting; articles claiming that neuroscientists have shown that free will is an illusion, for example. The classic situationist experiments aren’t news now, of course, but they continue to be cited in new studies on situationism or automaticity. One way to spin news about these studies is pessimistic: for example, being in a group that witnesses an emergency has an enormous effect on your behavior, and there is nothing you can do about it. Another way to spin the news is not: now that you know about the bystander effect, do you have a better chance of resisting your inclination to remain passive the next time you find yourself in a group that witnesses an emergency? Here we see two very different takes on the same findings. Keep in mind that even if you’re never a subject in a scientific experiment, being in a bystander situation is a realistic possibility. So, if you saw a young woman being assaulted on a busy street or an old man slip and fall in a crowded mall, would it be up to you to some extent whether you tried to help? The situationist experimental findings fall far short of proving that it wouldn’t be. And knowing what you do about the bystander effect, you might make a special effort to step up to the plate and take control of the situation. Knowledge is power. Forewarned is forearmed. Alfred Mele is the William H. and Lucyle T. Werkmeister Professor of Philosophy at Florida State University. He was director of the $4.4 million Big Questions in Free Will Project (2010-13) and is the author of ten books, including Effective Intentions (2009), Backsliding (2012), and A Dialogue on Free Will and Science (2014). His book Free will be published soon by Oxford University Press.